Statistics South Africa’s report, titled “Capital expenditure by the public sector 2017”, held few surprises – especially happy ones – for practitioners in South Africa’s project economy. The report confirms that total capital expenditure (capex) by the 751 public-sector institutions that reported their capex figures to the agency decreased by R12.1-billion last year, from R283.3-billion in 2016 to R271.2-billion. It was the first year-on-year public-sector capex decrease since the 2009/10 fiscal year – the period coinciding with South Africa’s financial-crisis-induced recession. The decline put to rest government’s previous narrative of public-sector expenditure providing countercyclical support for an economy still struggling to recover from the crisis. The outlook is not covered in the report, but all signs point to a sustained period of downward pressure. Most of the State-owned companies (SOCs) are in financial distress, largely owing to years of weak management and corrupted governance, which facilitated a redirection of procurement budgets towards a predatory elite. The outlook is undermined further by most SOCs now having massive debt burdens to address and interest bills to manage. What does this mean for gross fixed capital formation and the domestic project pipeline? It means that any recovery will have to be led by the private sector. However, to achieve such a shift, investor confidence will have to be restored and sustained. 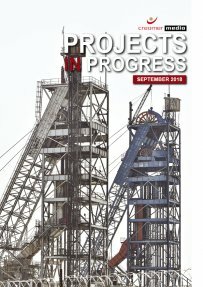 Nevertheless, this second edition of the Projects in Progress for this year includes valuable updates on some of South Africa’s largest infrastructure projects, as well as ongoing investments in the gold, coal and platinum sectors. Please note that this is a large file and may take some time to download. Published on: 04 October 2018.